Nandi The Bull, originally uploaded by Rima_B. 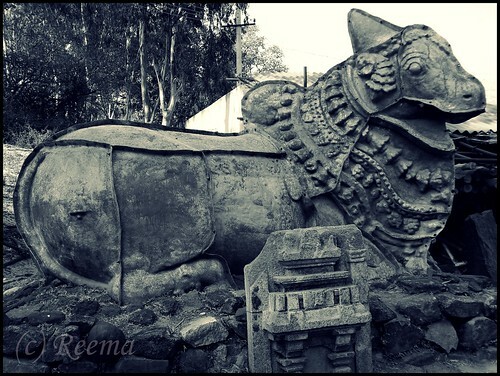 Nandi (the bull) is the vehicle (vahana) of Shiva and is normally found in all Shiva temples either near the idol or facing it from a distance. It is also placed at the entrance of Shiva temples in a sitting or standing posture. In paintings he is shown pure white. He has a rounded body, large brown eyes, heavy shoulders, a shining coat and a black tail. The hump is like the top of a snow-capped mountain. He has a golden girth round his body and sharp horns with red points. Originally, under the name of Nandikeshvara, Nandi seems to have existed in human form as a sage (Rishi) who acted as Shiva’s door keeper before achieving divine status. The reason for the association may have stemmed from Shiva’s relationship with Rudra who was sometimes referred to as the bull. Source – The blog "All You Need to Know About Hinduism"
And they also say if you whisper your wishes in his ears they directly go to Lord Shiva and they get fulfilled. tai na ki? next time I will try!